The myth that people with disabilities travel less than the general population is slowly being dismantled as the demand for accessible travel services globally steadily increases. Research shows that the value of the inclusive tourism sector in 2008 was at no less than 11%, and should now be even higher. As such, one would expect, that the creation of travability, i.e. ensuring accessible ground transportation, accessible tourist destinations etc. is no longer seen as “charity”, but rather as a good business opportunity. It seems however that the tourism and travel industry continue to view inclusive tourism as a small sector that needs to be "accommodated", and that by and large there is not sufficient understanding of the varying requirements of travellers with disabilities . Over the past twenty years, many states implemented laws which require that a certain percentage of facilities, including car parks, toilets etc. fulfil the needs of people with disabilities. While these legislations have definitely opened up access to buildings, public transport, accommodations and tourist attractions, the fact that it is a matter of legal compliance, rather than one of raising awareness, has relegated the notion of accessibility to a technical category along with fire protection, emergency exits, alarms etc. As such, most facilities simply try to fulfil the minimum required by law, rather than thinking of new innovative ways to provide accessibility and enable an inclusive environment. One of the most important issues for travellers with disabilities is accurate information. Yet very often also the provision of information is driven by the compliance approach, which limits the definition of accessible tourism to travellers with a mobility related disability, and therefore usually fails to recognise that travellers with disabilities have differing needs. Perceived as a secondary issue, informations on accessibility is hard to find and often hidden under "other information". In an ideal case the information should provide sufficient information to enable the traveller to make their own informed decision. 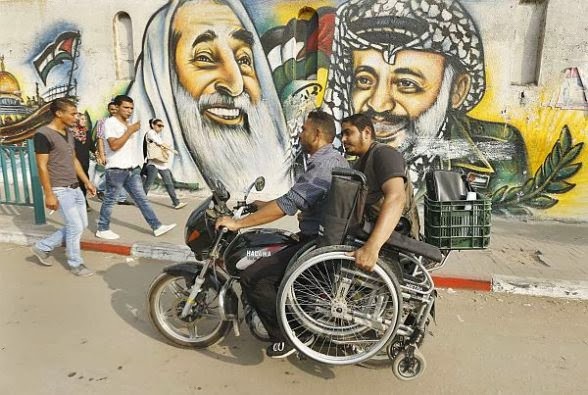 In 1999 Israel implemented the Law for Equal Rights for Persons with Disabilities, which requires among other things that public services and transportation, places of public accommodations and services must be accessible to people with disabilities. Sadly, even 12 years after the implementation of the law, Israel remains only partly accessible. Considering the economic significance of tourism to Israel, the Ministry of Tourism has in fact been trying to make major tourist sites more accessible to everyone. The fortress of Masada, for instance is by now fully wheelchair accessible and in Tel Aviv you can find four beaches (Tzuk, Northern Tzuk, Metzizim and Hilton) which are officially tailored for people with disabilities. Although frequently claimed otherwise, public transportation is not always accessible, and many of the inner city buses do not have ramps, yet, trains and the new cable cars do. Notwithstanding those deficiencies, there are plenty of dedicated non governmental organisations in Israel, which are working towards a more inclusive country and which are also providing guidance and active help to tourists. At Yad Sarah for instance, you can borrow wheelchairs, scooters, blood pressure cuffs or any other specialised medical equipment you may need during your stay. Obviously, with the Israeli occupation curbing development in the Occupied Territories in general, also the inclusiveness of tourism in the West Bank is limited. While it is hard enough to find general tourist information, information on the accessibility of specific places and sites in the West Bank is almost impossible to find. One of the few exceptions is Access in Israel, which, although published in 2000 and therefore pretty outdated, also includes some relevant information on cities in the West Bank. is definitely possible and worthwhile for all. Inclusive tourism should not be based on legal compliance, but should mean the creation of "an environment where people of all abilities are felt welcome and wanted as customers and guests.” Green Olive Tours is working hard to fulfil this goal and will be happy to accommodate your needs, whatever they may be. If you are planning a trip to the region, contact us here, and we will do our best to customise an itinerary for you, which can include everything from accessible transportation, to hiring an attendant, equipment and so on. Recognising the restrictions and the lack of relevant information on inclusive travel especially in Palestine, we would like to invite you to help us further our understanding of your needs and specifically seek your guidance in order to make Palestine more accessible and to become a truly inclusive tour company.